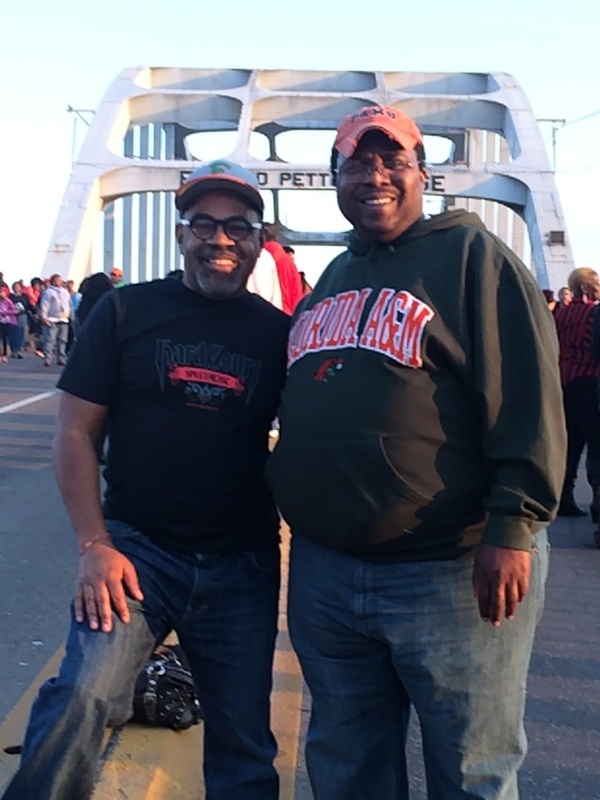 Editor’s Note: Local resident Darryl Jones joined thousands in Selma, Ala. to take part in the 50th Anniversary of “Bloody Sunday.” He just returned home and shared his experience of the weekend’s festivities. 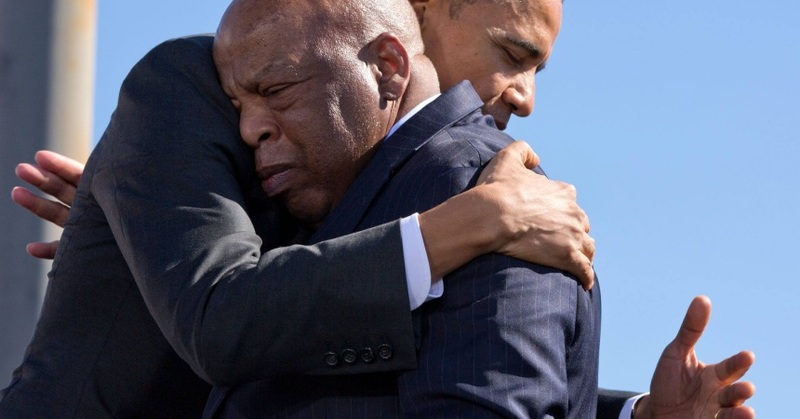 Forty-Fourth President of the United States Barack H. Obama hugs Congressman and civil rights icon John Lewis on the 50th anniversary of Bloody Sunday. Darryl Jones (on right) is joined by his friend Tola Thompson as they join in with the festivities on the 50th Anniversary of Bloody Sunday. On March 7, I joined thousands at the foot of the Edmund Pettus Bridge to witness the 44th President of the United States of America be introduced by a man whose gallant efforts 50 years ago, at this same site, was the reason for our assembling. 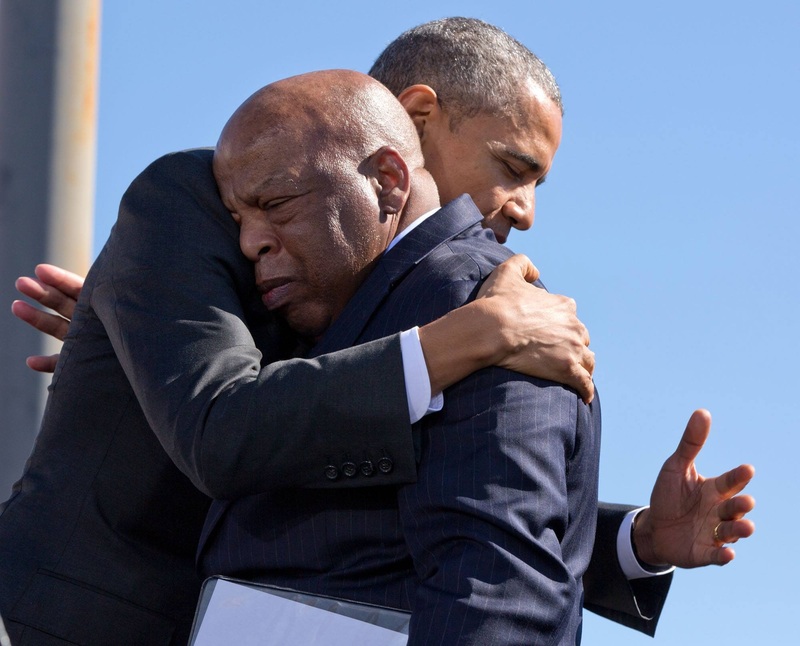 When President Barack Obama and Civil Rights icon and Congressman John Lewis embraced, there was a collective sigh punctuated by sniffles and cries and “amens” and shouts of praise at what we had just witnessed. Bishop A.J. 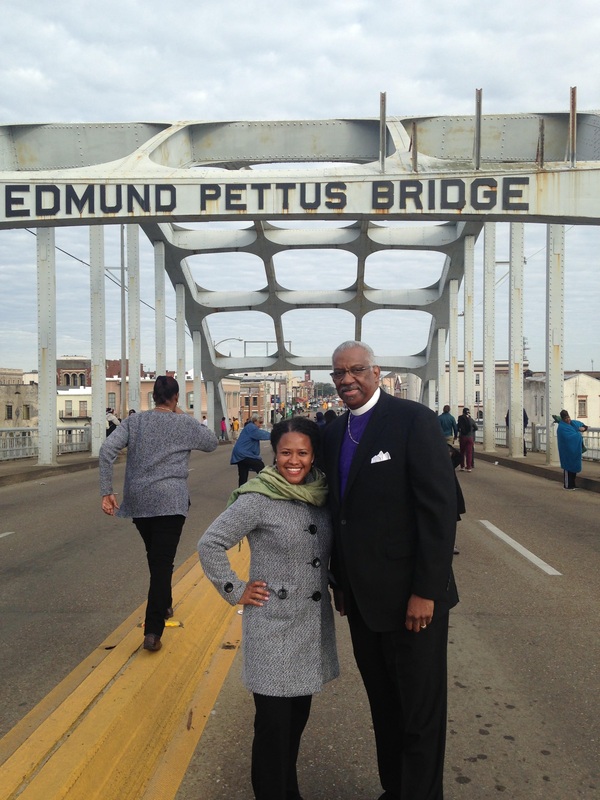 Richardson and Bethel AME member Kara Irby stand at the historical Edmund Pettus Bridge. Angela Hardiman Cole told me she was proud that I traveled to Selma, Ala., because I was truly an accountable beneficiary. What an odd choice of words. Beneficiary, as I have often used it, means a person who is given something great through no great effort of their own. Certainly, it was not lost on the crowd how Obama was a beneficiary of Lewis’ literal “courage under fire.” But Obama was not the only one. All subsequent generations were beneficiaries of Lewis’ struggle for equality. Witnessing the president’s address on Saturday and U.S. Attorney General Eric Holder on Sunday, it made you feel like Lewis and Hosea Williams and the march in Selma and their non-violent gallantry and bravery on Bloody Sunday was as heroic as General George Washington in Yorktown and General Ulysses Grant in Vicksburg. A.M.E Bishop Adam Jefferson Richardson, Jr., Resident Bishop of Florida and the Bahamas was also in attendance and he said it best, “It has been bequeathed to us to continue the fight. It is more than symbolic, but a reality of our present day –” we are beneficiaries. Over the course of two days of speeches, there were frequent references or allusions to Sir Isaac Newton’s, “If I have seen further today, it is because I stand squarely on the shoulders of giants.” The Civil Rights Movement and Bloody Sunday should specifically remind African Americans that we stand on more than shoulders. We stand on tombstones and coffins and the bloody boughs of trees. Although there were hugs and kisses and pats on the back when seeing old friends as we retraced the same steps as Lewis, Williams, Rev. Martin Luther King, Jr., Rev. Ralph Abernathy and others—the sacrifice and martyrdom of Jimmie Lee Jackson, Rev. James Reeb and Viola Luizzo evoked a solemn gratitude. Like Bishop Richardson and the 70,000 others present and the millions of others who have the right to vote and enjoy their civil rights, I am a grateful accountable beneficiary—To God be the Glory! Darryl Jones is executive director of the Bethel Community Development Corp. of the Bethel African Methodist Episcopal Church, chair of the Tallahassee-Leon County Planning Commission and a member of the Tallahassee Memorial Healthcare Foundation Board of Trustees. see more photos in your local Capital Outlook.